$70 ideal for about 12 - 19 pax. $90 ideal for about 16 - 24 pax. $120 ideal for about 21 - 32 pax. 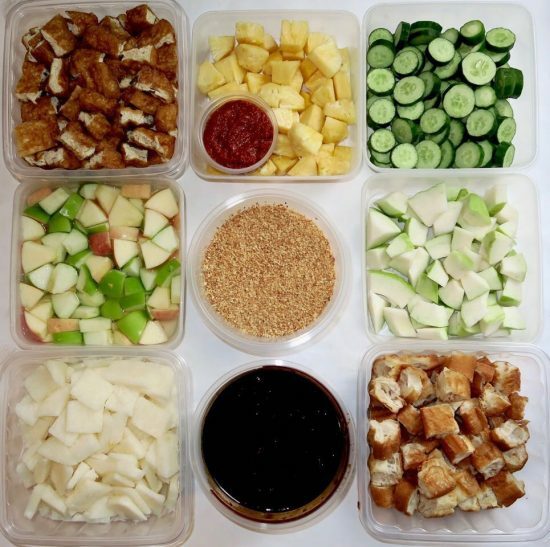 Toasted You Tiao and Tau Pok, Pineapple, Japanese Cucumber, Guava, Turnip, Red Apple, ROJAK LINE's Finest Rojak Paste, Peanuts and Chilli. $100 ideal for about 16 - 20 pax. $150 ideal for about 24 - 30 pax. $200 ideal for about 33 - 38 pax. Toasted You Tiao and Tau Pok, Pineapple, Japanese Cucumber, Guava, Turnip, Red Apple, Green Apple, Mango, Spicy Cuttlefish, Cuttlefish, ROJAK LINE's Finest Rojak Paste, Peanuts and Chilli.